I love decorating our mantle for the holidays and seasons, mainly because it’s small enough to not feel overwhelmed but in a spot that makes the whole house feel festive. In other words, it’s my lazy way of decking the halls. Thanks to Danielle’s Craft with What Ya Got Challenge, I was challenged and inspired to make lots of bright DIY’s with the help of paint chips and this tutorial. 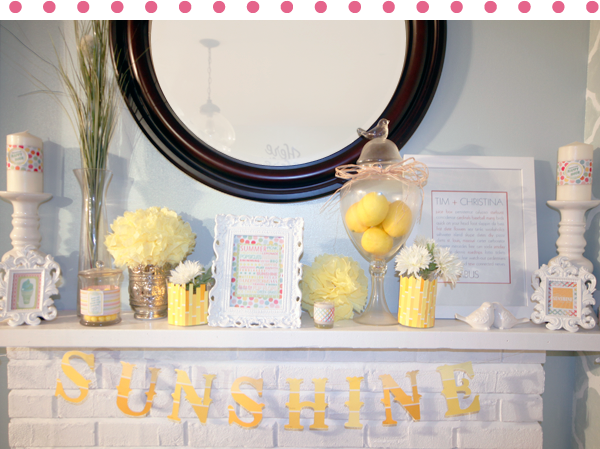 Now my mantel looks like our own little lemonade stand! My favorite is the little quote that says, “If life hands you lemons make lemonade, if that doesn’t work add vodka”. I think I will make that my summer mantra. Just like every time I do a mantle post I have to apologize for our crazy fish tank lighting and awesome shadows. One day my photography skills will be good enough to compensate, I promise. Have you been doing any summer decorating? 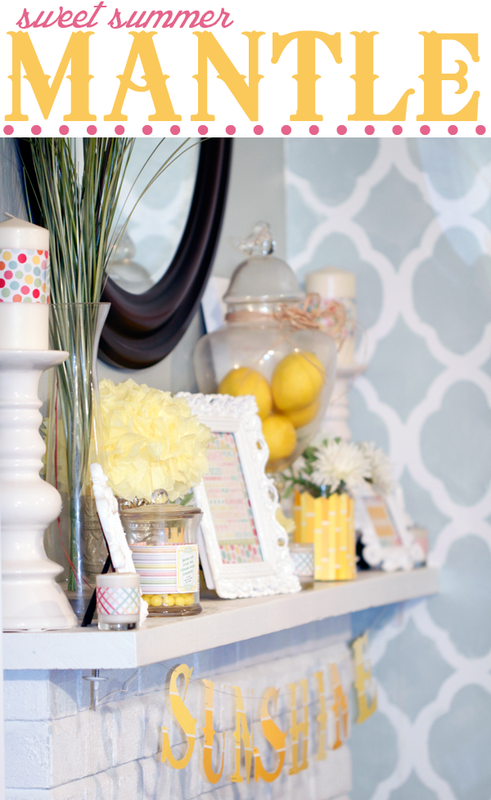 Have you made any fun paint chip crafts? Want some tasty lemonade? With vodka? Oh girl, I LOVE that sunshine banner! You are the best. Tim better love this one! Tim has a conscience… what’s up with that?!? Just kidding 😉 I always feel bad too but I think I pay them back when I get a bazillion $3 samples because I just. can’t. decide. on a color! They are the Olympic paint chips, but I am sure Behr would work too. Just not the ones with the little squares cut out (from experience those dont work hahaha). Thanks I am BEYOND excited for next week!!! Thank you so much for hosting this awesome link up! Did you use your silhouette to cut out the letters? No, I actually just printed out the letters on paper and used them as stencils. I can’t believe I didn’t think to use my Silhouette!!! !